A flute ensemble with drums and percussions! Instrumental flute music from all over the world in a wide variety of genres: The Police and Led Zeppelin hits with folk music from Spain, Iran, Galicia, Ukraine and Latin area... with a final surprise with Frank Zappa! Recorded by Marco Giaccaria between July, 2016 and October, 2017. Mixed and edited by Marco Giaccaria, Claudia Fassina, Maria Chiara Maccarrone and Viola Rolandone between September and November, 2017. Cover drawing by Francesca Maccarrone. Produced by Marco Giaccaria for Musica Mancina, 2017 - GRCD71. 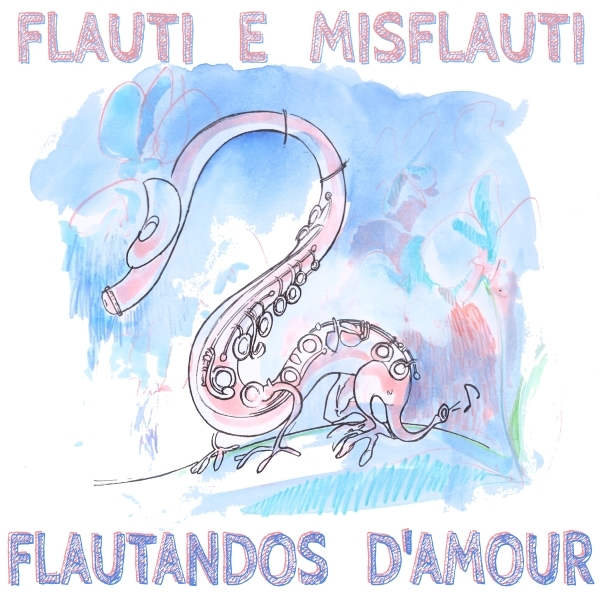 Flautandos d'Amour is the second album by the flute ensemble Flauti e Misflauti. This ensemble was born from an idea by Marco Giaccaria. Just like a breath, the album starts with Rock pieces by The Police and Led Zeppelin, played by flutes and drums. It's a journey through the sounds of distant regions and a tribute to Rock authors. The flutists are: Davide Andreone, Claudia Fassina, Marco Giaccaria, Maria Chiara Maccarrone, Viola Rolandone and Giulia Ventrice. They also play drums (Claudia Fassina), percussions (Davide Andreone and Marco Giaccaria), bass flute (Davide Andreone) and all the girls meowing on... surprise, surprise! Some ambiences help to enjoy the compositions. The last two tracks are medleys: So Lonely/Roxanne/Can't Stand Losing You is called Flautandos d'Amour, while Dwarf Nebula/Le Gattine di Mezzanotte is better called Dwarf Nebula Meets Le Gattine di Mezzanotte (in English are The Midnight Kittens). Obviously... Flautandos d'Amour is a tribute to the great Police album Outlandos d'Amour!